Embroiderers' Association of Canada, Inc.: Fall is a Time of New Beginnings! Fall is a Time of New Beginnings! ﻿With September comes the start of the new year of guild/chapter meetings. As part of the Toronto Guild of Stitchery I am extremely fortunate to attend both the day and evening meetings. When I joined the guild I attended the evening group as I worked full time and had two small children in school. Now my children are both at university and I am retired with my husband and can attend both groups. Many guilds across Canada have noticed that it is difficult to attract new members. Offering a day and evening group is a great way to attract new members and revitalize your guild. Our evening group has it’s own program committee therefore day and evening groups can work on separate projects and learn new things. communications@eac.ca. Our National Stitch in Public Day is an awesome way to introduce people to the art of hand stitching which we are so passionate about. I had an opportunity this summer to give my son’s girlfriend a stitching kit while she was in the hospital. 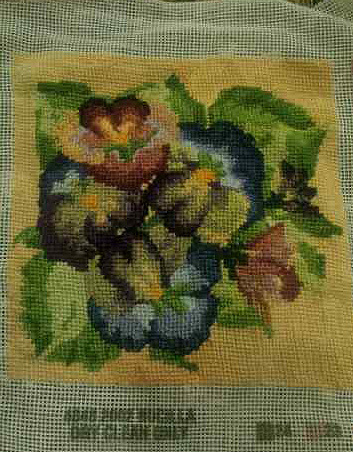 The kit I selected was a floral needlepoint on a painted canvas that when completed zips up into a mini purse. No framing or fancy finishing is required. I was hoping for her to experience that awesome sense of completion and usefulness. I must admit I was thrilled when my son told me she had completed the purse and was interested in trying something else. When I was a child and I was travelling on a bus or sitting in a doctor’s waiting room people were stitching or knitting etc. to pass the time and make something. Today people have many, many diversions to occupy their time and energy. Living in Toronto you are far more likely to see people engaged with their smart phones or iPods. As stitchers we need to flaunt our talents. 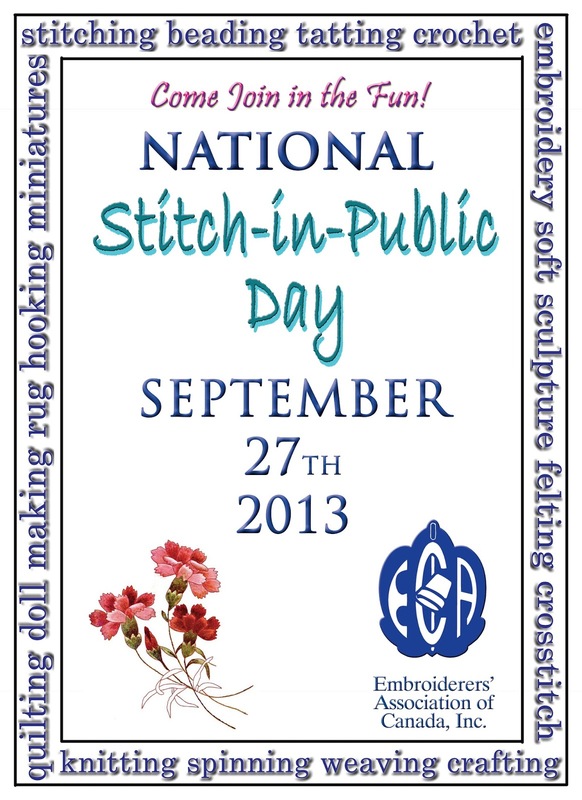 You may never know how you might influence someone to take up a needle and enter the world of stitching! I enjoyed your blog post and agree that we need to promote our craft more. How neat that your son's girlfriend finished her needlework project. What are you going to give her to work on next? I think even stitchers are not stitching as much in public as we used to. Time to reverse that trend. Winter is Coming . . . Sorting some more … reflecting .. and ..